ISO 9001 revised edition was issued in September 2015, as ISO9001:2015. 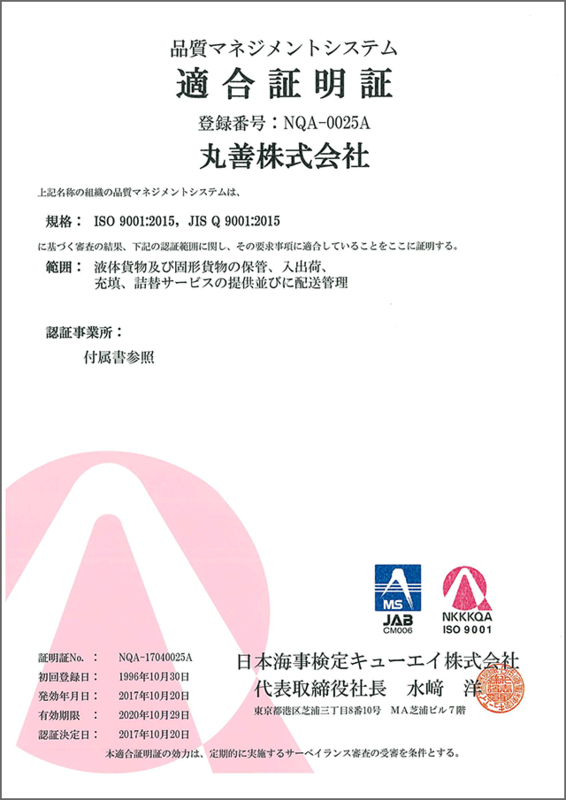 The transitional inspections of the the old edition ISO9001:2008 was finished in October 2017, and obtained certification for the revised one. We will then make further efforts in following matters. Understanding of circumstances of the organization and integration of the business process. We clarify internal and external problems of the organization, understand needs and expectation by customers and other relevant interested parties, and then reflect them into our quality management system. Moreover we consolidate quality management system into our business process, and we perform its united operation. Through our quality management system, we try to clarify what kind of goals we are looking for more than ever. And then we focus on not only the reliability of the operation by the plan, but also its performance itself. We operate by constructing management system which assuming chances and risks that could happen because of its quantity. We however review the documents to know how much they need to be modified, and document their procedure manual and keep them to support our operation of the process. We also retain the records to make sure the process is successfully performed as it planned.